This post is sponsored by Wayfair. All opinions are 100% my own. Your entryway–no matter how small–is the first impression of your home. Today I’m sharing 7 easy, practical things you can do to create an organized entryway and make the most of your space no matter its size. When you set out to make over a space, always begin by considering the functions it needs to serve. Most modest-sized homes don’t devote a lot of square footage to the entryway, yet it’s a space that demands hardworking storage and systems. No matter how big or small your entryway is, there are a few basic things you can incorporate that will help you create a clutter-free, organized entryway. 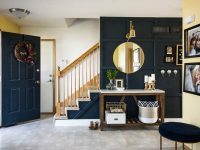 I shared all of the pretty photos and fun before and afters of our Modern Navy Small Entryway Makeover last week and am so glad you all love it as much as I do! I’m back today to really break down the more functional things I used to make sure this little area not only looks stylish but is also packed with things that will keep our family organized. Our entryway is basically a small hallway. Both the front door and the garage door open up into this room, making it a high-traffic area and the first impression people see when they walk in the door. Although I really only had one itty bitty wall to work with, I knew that with a little planning I could incorporate some features that would make this space pretty while improving the way this space functions. No matter how big or small your entryway is, it’s important to stand back and evaluate what types of organization you can add that will help keep your home organized. The good news is you don’t have to sacrifice style for function! 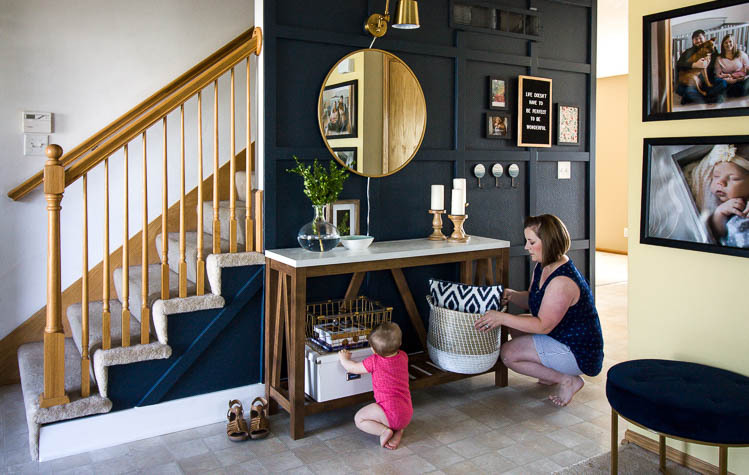 There are so many easy ways to create organized systems in an entryway that are super functional and also look really nice. 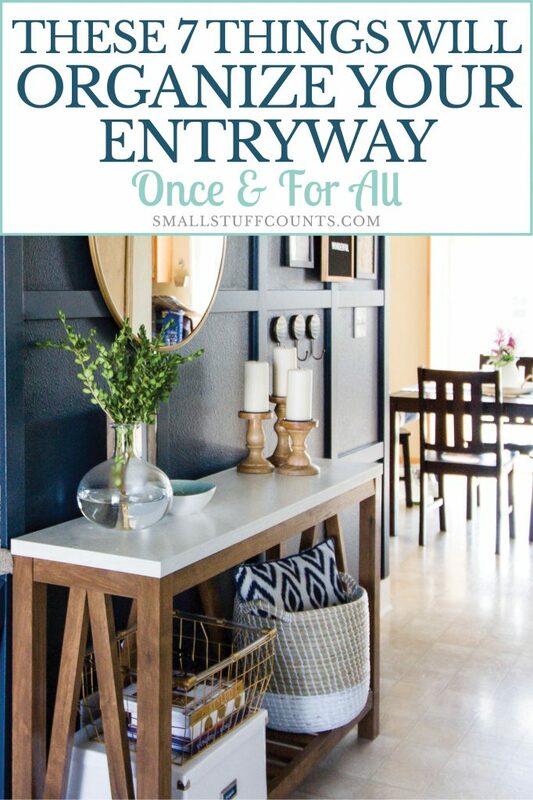 Today I’m highlighting 7 simple and practical things you can do to create an organized entryway! 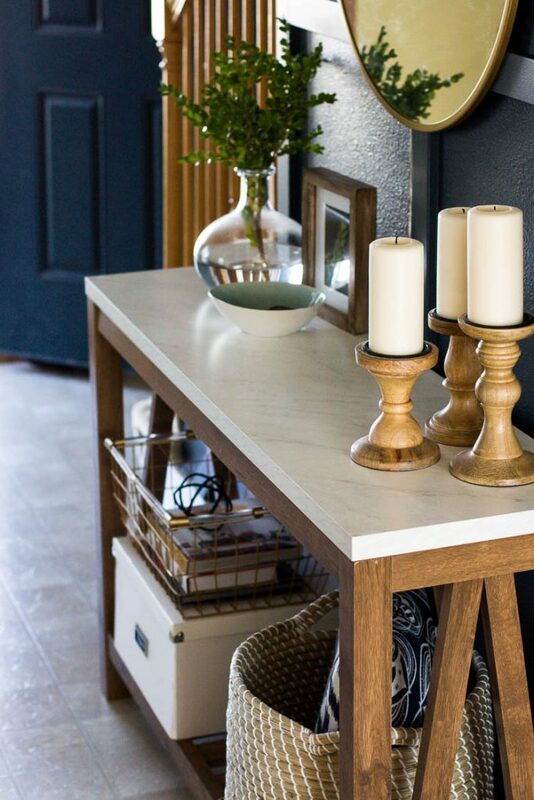 Adding a console table, small table or even a shelf (if your entry is super tiny) is an excellent way to improve the way your entryway functions. Having a surface for dropping keys and mail will help keep things organized and off of the floor. You may remember a while ago that I was shopping for the perfect console table for our small entryway. 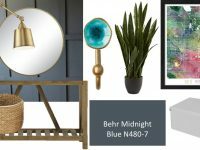 Since our entry is basically a narrow hallway, I needed something slim and ended up falling in love with the Brandy Entry Console Table from Wayfair. Isn’t it pretty? The faux marble top looks remarkably realistic and the wood is such a pretty color. 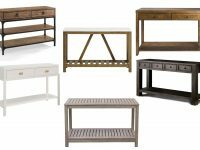 Shop more console tables at Wayfair.com. Wayfair sells a lot of pretty console tables with drawers or doors that I initially thought would be the best since they would give me even more storage, but I ultimately decided to choose a console table that’s more open. Since you see the side of this table when you walk in the front door, I thought a more open table would keep things light and from feeling too cramped in this small area. Plus, it’s always a good idea to add more storage space if you need it but when I really thought about it, I decided our coat closet offers enough closed storage for us. Sometimes adding storage space you don’t really need just encourages you to hoard clutter. Shopping Tip: When you are shopping for a table for your organized entryway, first measure your space so you have an idea of what size table will fit. I opted for a more open console table that can hold baskets and bins on the bottle shelf. There are also tons of table options with drawers, doors and smaller shelves that will give you even more storage space. 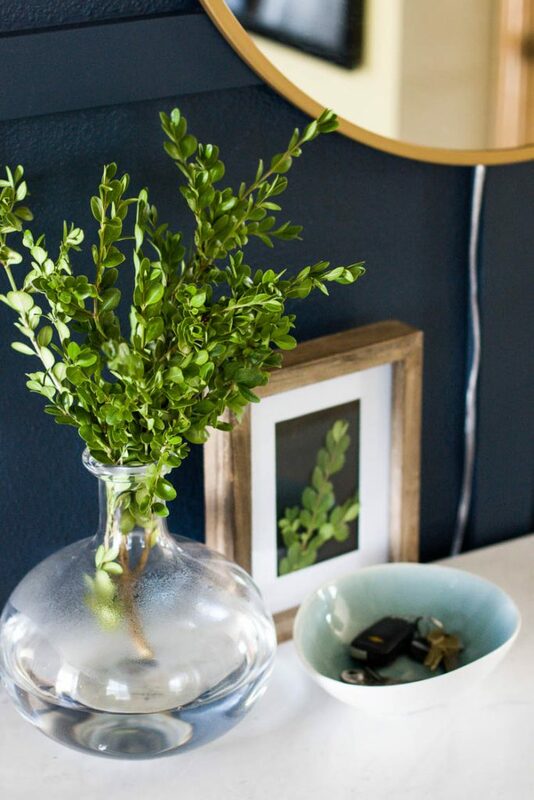 Every entryway should have a designated spot for keys and other odds and ends! If you get in the habit of always dropping your keys in a bowl or hanging them on little hooks right when you walk in the door, you will avoid the panic that ensues when you are rushing to leave and madly searching for your keys. I love to set out a pretty bowl on the table for everyone to drop their keys in. Pretty bowls are easy to find and fun to switch out with the season. The bowl on our table holds our car keys and is also a great catch-all for loose change and other little things. Shopping Tip: Look beyond organizers specifically designed for keys! You can find cute key hooks but also look for decorative bowls in the kitchen and household sections. Every entryway should have at least a few hooks on the wall. These make it easy to hang up jackets, scarves, hats, backpacks, and purses so you can prevent them from piling up on the floor or a chair. Even if you have a coat closet, I think adding a few hooks are perfect for guests and give you a convenient spot if you’re in a rush and don’t want to bother with a coat hanger. We are fortunate to have a nice coat closet in our entryway, but I still thought it was important to incorporate a few hooks. I hung some decorative hooks on our entry wall that look pretty but are also super functional. Shopping Tip: Choose decorative hooks that look pretty but are also super functional! Hooks can be purchased individually or you may want a hook bar for even more storage space. Consider over-the-door hooks for the inside of a coat closet door or add a couple small hooks to the back of your front door if you’re really tight on space. Seasonal items like hats and gloves can quickly clutter up a small entryway. Storing them inside a decorative box or basket is a great way to hide the clutter but still keep them easily accessible. 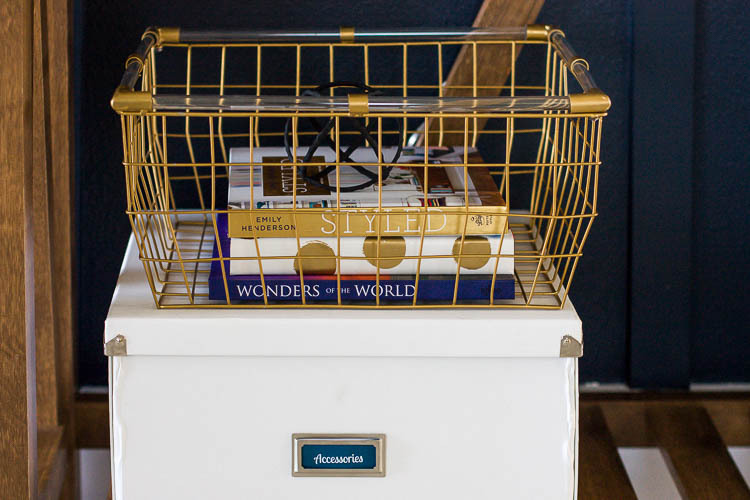 Add a pretty label to your storage box or basket to make things look even more organized and stylish. Think beyond cold weather items, too! Our storage box is a great place to corral winter items, but it’s also perfect for stashing things like umbrellas and sunscreen in the summer. Shopping Tip: Look for pretty storage boxes with lids to keep clutter out of sight. Having a lid also makes it easy to stack other things on top of it! If you are a family that tends to pile shoes by the door, consider designating a space for them so they don’t end up strewn all over the entryway floor. If you have room for a small bench, you can tuck your everyday shoes under it or potentially find a bench with built-in storage. Otherwise, a large basket makes a great drop zone for shoes! I added a basket to the bottom shelf of our console table that is the perfect place to stash a few pairs of shoes. Tucking a decorative throw pillow or blanket in the basket is a great way to add something pretty and conceal your stash of shoes underneath. Shopping Tip: Shop for a small bench that can store shoes if you have the room. Otherwise, a large basket or crate is a great place to stash shoes. One item that you may not think to add to your entryway is a basket or bin to hold outgoing items. Whether you have library books, store returns or items borrowed from friends, it’s helpful to have a central place to store those things so you remember to grab them on your way out the door. 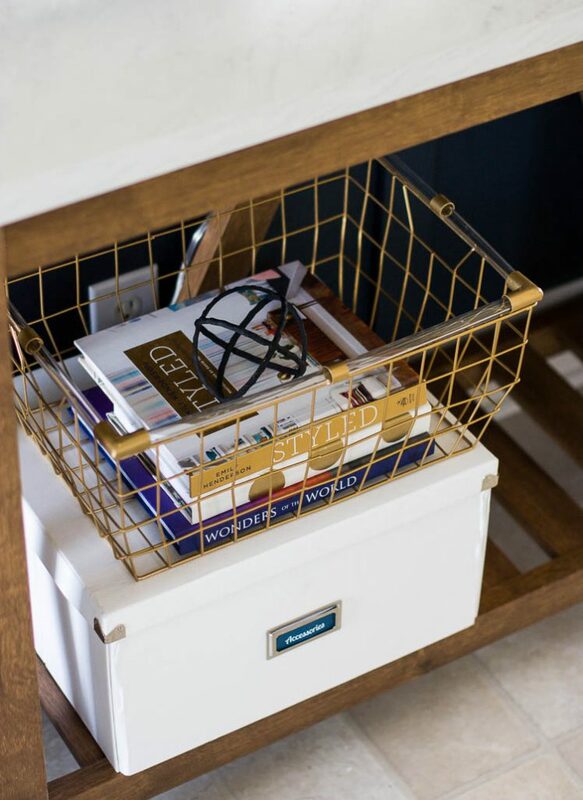 I added a medium sized wire basket to the bottom of our console table that is decorative and the perfect spot for outgoing items. Shopping Tip: Shop for a medium sized basket or wooden crate that’s decorative so it can be left out in your entryway. If you have room in your entryway, a stool, chair or bench gives you a place to sit and put on your shoes when you’re coming and going. Our entryway is too narrow for much seating, but I added a small ottoman near our console table that makes a great impromptu seat or a place to drop bags when we come in the door. Shopping Tip: Measure your entryway and shop for seating that fits your space. Trying to cram a too-large piece of furniture into your entry will make it feel smaller. A small stool or ottoman is a great way to add seating without taking up much space. If your console table is open on the bottom, you could even tuck a stool underneath the table when not in use. Which items are you going to use in your organized entryway? Is there anything you would add to the list? Let me know in the comments! 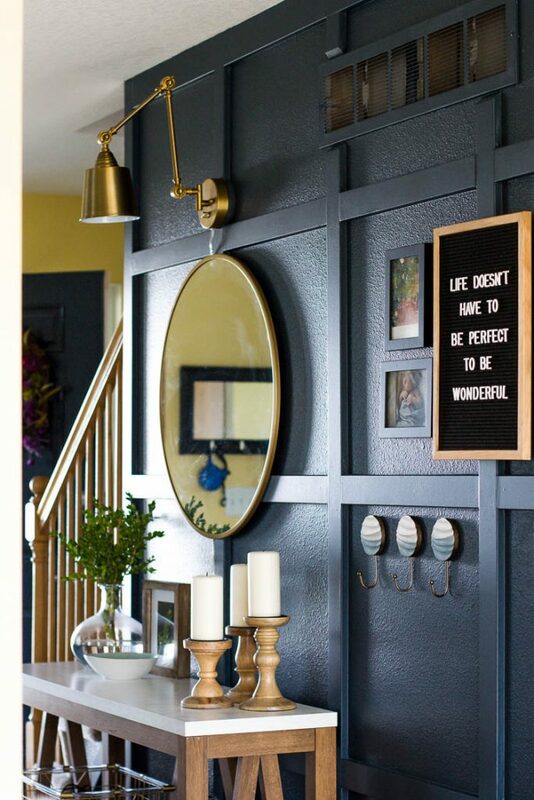 Shop for all of your entryway organization needs at Wayfair.com (they have such a huge selection of great organizing products and entry furniture!). 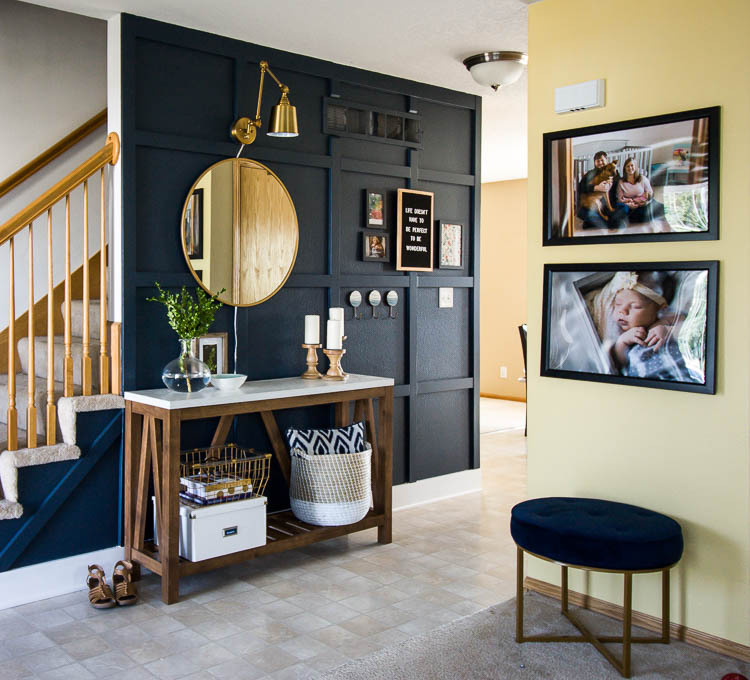 See product sources and more photos of our Modern Navy Small Entryway Makeover in this post. You can also catch up on all of the real-time updates from our entryway makeover by watching the highlights in my Instagram stories! Planning your own room makeover? 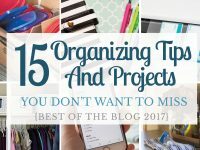 I created a free Home Project Planner to help you plan everything from your ideas and budget to your project tasks and shopping list. Download the FREE Home Project Planner here. « Design Plans For Our Front Room – Which Option Should I Choose? 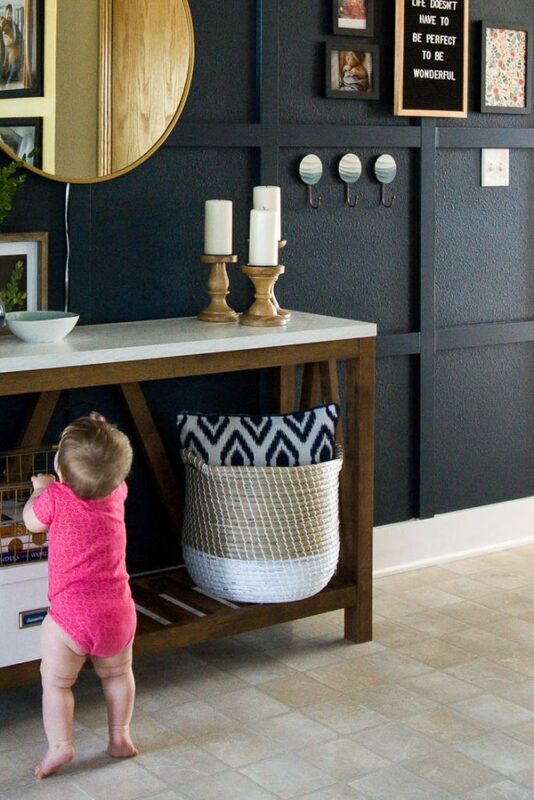 I love your entryway makeover and the color is beautiful. I would love to incorporate your ideas, but right now I am living in a rv so there is not much space, but maybe eventually. Thank you for sharing. I’m so glad you like the makeover, Robin! 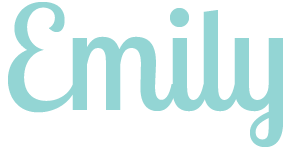 Check out the DIY Mommy blog/Youtube for inspiration for decorating an RV. Hers is super pretty inside!